Particularly given the results of the latest report released by the Intergovernmental Panel on Climate Change, we must ask ourselves some critical questions about how we prepare our children to face the world they will be inheriting, and the harsh truth of today’s conditions and dynamics. How do we ensure that our youth emerge from their studies with an understanding of the intersection between our social, economic, cultural, political, and environmental status in society? How do we teach them their role as influencers of what’s happening in their environment, now and in the future? 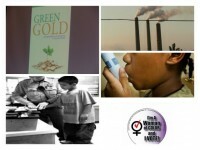 The Environmental Justice Classroom Resource Guide provides a list of clearinghouse websites with multiple environmental justice (EJ) resources for various age groups, a list of individual EJ lesson plans for various age groups, and a short list of hip-hop videos/songs to help engage youth in classroom settings and beyond. Take the NYC Climate Convergence Survey! Thank you for attending the NYC Climate Convergence organized by The Global Climate Convergence and System Change Not Climate Change. We look forward to building on this paradigm-shifting weekend toward the next steps! People’s Climate March Route Finalized! The official route for the People’s Climate March happening September 21, 2014 in New York City has been finalized. The climate change march in New York on Sept. 21, expected to draw as many as 200,000 people, is one of the last gasps of conventional liberalism’s response to the climate crisis. It will take place two days before the actual gathering of world leaders in New York called by U.N. Secretary-General Ban Ki-moon to discuss the November 2015 U.N. Climate Conference in Paris. The marchers will dutifully follow the route laid down by the New York City police…. Vote for the Overpass Light Brigade in the 2014 PBS Online Film Festival! The Overpass Light Brigade shared their amazing art and organizing talents during Earth Day to May Day 2014 and there are so many moving images that were shared by OLB chapters from across the country and from around the world! This video marked the launch of the Convergence with the Earth Day to May Day actions of last spring. We are now mobilizing in the same spirit for the NYC Climate Convergence, Sept. 19-21. Enjoy this original call to action, and stay tuned for a new video later this month. 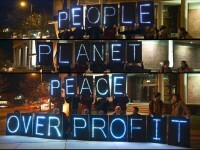 There is so much momentum for People, Planet and Peace over Profit! The 10 days of action helped invigorate those who have been educating, agitating and celebrating in support of economic, climate and food democracy. The action also helped grow the movement of people aware of the problems and ready to become a part of the solution as big as the crisis we face by coming together with other groups and demanding change now! 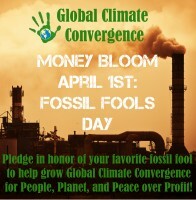 Help Us Grow the Fossil Fool MoneyBloom!